Participating in God's mission on earth is a grand invitation to all disciples. It is sometimes difficult to know where to begin. And how. And when. We all have different personalities, experiences, circumstances, resources, and schedules - so, one size does NOT fit all. Otter Creek desires to walk with each of its members as we strive to be more like Jesus. What does that look like for you? It doesn't have to be guess-work. Take a look at what God might already be doing around you. We can help lead you to various mission opportunities (foreign & domestic) in order to better discern how God is calling you as a disciple of Jesus. Check out this video designed toencourage OC members to "Be Part of God's Mission Today!" Click here to communicate your basic interests. This is a good way to start a conversation and help us suggest ministries that might be a fit given your background and gifts. Otter Creek also offers a more extensive Spiritual Gifts Assessment Tool. This is a great way to contemplate how God has uniquely prepared you for participation in His Kingdom. If needed, Eric Livingston (Community Life Minister, eric@ottercreek.org) or Duane Dixon (Missional Discipleship Minister, duane@ottercreek.org) can help guide you through this process. As a church, reaching out is a central part of the Otter Creek culture. The mission of God is all around us and our aim is to point each member to that mission. Visit the new OC Mission Center in the main lobby to learn more about what's happening all around us. See photography, artwork, video, and printed publications depicting the many opportunities for service and mission. These tangible expressions all point to God's invitation to YOU, a disciples of Jesus, to be active in the work of the Kingdom. We believe the Mission Center will inform, lead, and inspire you and your friends to join in where God is already at work! 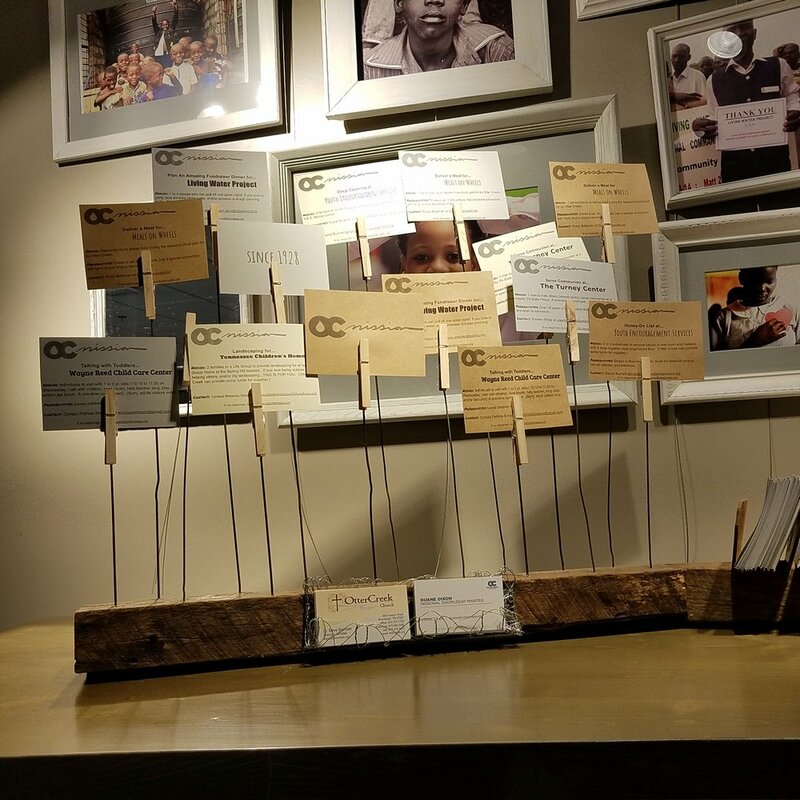 From Nashville to Kenya, Otter Creek is partnered with many amazing organizations, non-profits, and ministries. Each of these partners has specific volunteer needs. Otter Creek will feature these needs on a weekly basis at the new OC Mission Center in the main lobby. Look for the 3x5 service cards on display. Each card describes a simple way to serve RIGHT NOW. Individuals, families, or Life Groups are invited to grab a card and follow the instructions for that week. With this easy approach, we know you will be encouraged, develop meaningful relationships, serve those in need, and create more stories about God's goodness on this earth! This site is for telling stories. If you are an artist, a photographer, a writer, a musician, a painter, a composer, a story-teller, an innovator, or a conduit for ANY expression of the Kingdom of God, would you be willing to share with Otter Creek? Perhaps you have a song, a photograph, a lyric, a painting, a video, a poem, a story in some form or another that expresses something about the mission of God. We need you! Those stories can be used to encourage, inspire, and lead others. Simply reach out to Duane Dixon (OC Missional Discipleship Minister, duane@ottercreek.org), and share what's on your heart for the sake of the Kingdom.